Blog — Exhibit Solutions Inc.
"Microsoft Canada", "Microsoft", "trade show exhibit", lighting, "custom design"
"booth", "custom booth", "exhibit design", "exhibit", "hybrid booth", "hybrid display", "rental booth", "rental exhibit", "rental display", "trade show exhibit"
Every two years Octanorm Canada hosts a conference for partners who use the German display system. They introduce new extrusions & displays, present improvements they have made, host round table discussions, and also a design competition. The rental booths (and some purchased ones) that we custom design for our clients are built using this German display system. Unlike your traditional shell schemes provided by show contractors, most of our exhibits incorporate both rental and custom elements. 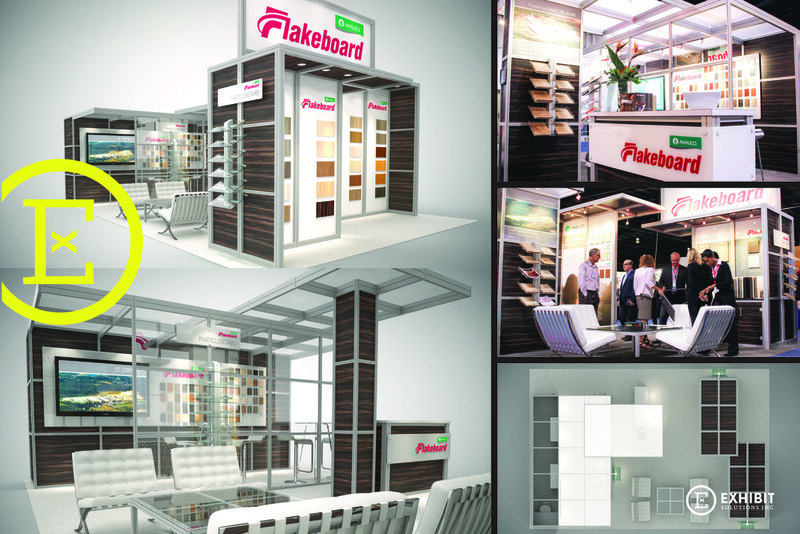 Unique laminates, custom millwork and customized lighting solutions, give our rental booths a look and feel that sets our clients apart from other exhibitors. Here are some of the designs we submitted for 2013. For entries from previous years feel free to visit the Octanorm website: Design Contest. With a 10' x 20' booth space at this year's HRPA (Human Resource Professional Association) Conference & Tradeshow 2014, ADP Canada updated their exhibit with a custom back-wall, some new full height graphics, raised logos & letters (a personal favorite) and if you look closely you will see the 'walk-in closet' a.k.a. storage room on the right of the booth (a close second favorite in my books). "Microsoft Canada", "custom booth", "custom display", "exhibit manufacturer", "hybrid booth", "photography", "trade show"
The EB Games Canada show takes place in a different location every year. This year it was held in beautiful Whistler, British Columbia. With a fantastic booth space (in the Grand Foyer of the Whistler Telus Conference Centre), the exhibit was spread out over almost 80 feet! We were able to take the whole foyer and turn the space into a complete Halo experience. We'd also like to thank Pascale at Gadbois Photography for the great photos she took at this event! A couple of my favorite elements in this booth were the dimensional HALO 4 logos and the HUGE 80" TVs we used in the XBOX360 area. I wish I could have been there - it looked like the attendees had fun (unfortunately I can't share the 'dancing' videos here!) but below is a tour of the booth. "booth", "custom design", "exhibit manufacturer", "exhibit", "flexible rental booth", "hybrid booth", "hybrid display", "rental booth", "rental display", "rental exhibit", "trade show"
I have this conversation a lot with clients: Why should they rent their exhibit? Because it makes sense. Not for every exhibitor and not at every event - but in many instances I see our clients benefit from renting instead of buying their exhibit. We created this advertising piece below (it was a double sided card - so the text below is the back). It summarizes the key reasons for choosing a rental booth. In essence - it's about flexibility and making your show budget go further. At least that is how I like to look at it. Gone are the days when Marketing Managers had 'unlimited' trade show budgets like in this custom exhibit with intricate mill work at the 1893 Chicago World Fair. We have seen many clients go from a 600 to a 200 square foot space, and vice-versa. This may be a result of changing Marketing budgets and because they invest in different sized spaces at different shows. Add another dimension, that these shows don't happen every year, and now what do you do with a booth purchase that only fits the space for one of your four events? Almost all our clients change their exhibit from one event to the next. Even if it's just adding seating or a meeting room, changing the layout, enlarging the storage room, or changing the size - you can always make improvements to your booth and I like that a rental exhibit gives you this type of flexibility. Unless you know that you will be using the same booth, in the exact same configuration for at least 4-5 shows, consider a rental exhibit. If there are some core elements that can be used at every event and in every size configuration look at a hybrid solution (a combination of custom purchased components + rental components). 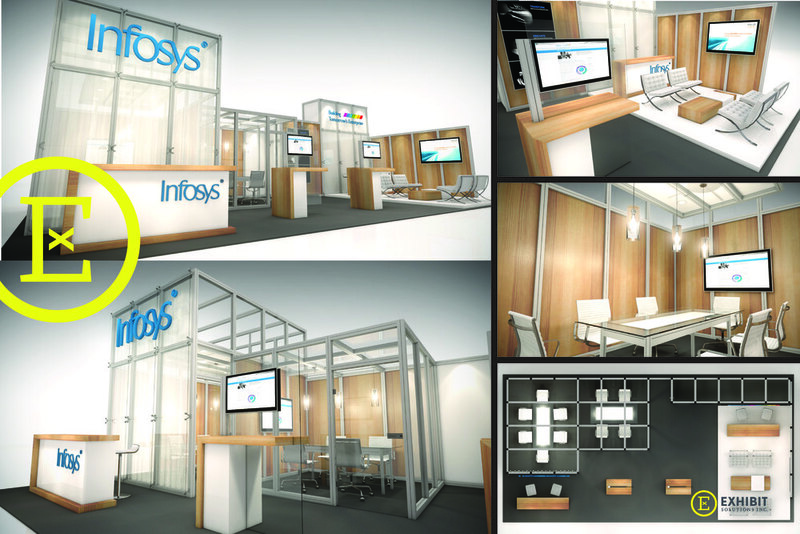 Hybrid solutions give you a little more customisation and unique elements within your rental exhibit. A lot of our exhibits are a mix of custom elements (purchased) and rental components, like this 20'x20' exhibit we designed for Pure Hothouse. The glowing pedestals, dimensional lit letters, and graphics were custom/purchased components and most of the structure is rented. That is why you can also see a 10'x20' concept in which a combination of custom components and rental structure is used. For the 10'x20' they only rent the exhibit structure they need instead of carrying the cost of the full 20'x20' version. I am sure we will come back to this rental discussion over the lifetime of this blog and even though I can appreciate that a rental exhibit is not the right fit for every company I think renting a custom designed display will continue to be a popular choice.